The Southwest Through Wide Brown Eyes: Looking Glass Road's Back End Way - Utah. Between Moab and Monticello on Route 191, just south of the La Sal junction, is Looking Glass Road (CR 131). Not only can you see Looking Glass Arch, but CR 131 leads to CR133 which leads to either Anticline Overlook (ungraded gravel/dirt road), or to the Needles Overlook (roughly paved road). All of this is part of what is known as Canyon Rims Recreation Area; full of camping areas, hiking, climbing, spectacular scenic overlooks and amazing sites. Of the three roads, I'm going to finish what I started which is Looking Glass Road, but from the back end up to its beginning on Route 191. CR 131 (dirt road) is just a hop-skip-jump from the "Y" intersection of the Overlook roads; make a quick right and you're on it. The first site on the road, well besides the awesome landscapes, is Eight Mile Rock; a "cow camp" where families would live while taking care of the local rancher's cattle. 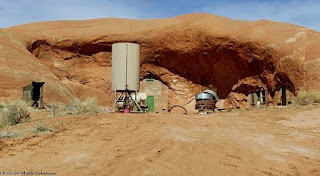 It was much easier to live there, then to travel back and forth from a home in Moab, La Sal or Monticello. By the way, there will be three different roads around that area; one goes around the back of Eight Mile Rock and eventually gets back to CR 131, CR 131 itself (neither have signs), and the last has a little sign bar that says "36 - Easiest"...do NOT follow this road unless you want to see the oil storage facility at the end of it. Yes, I'm speaking from experience here. As you continue down CR 131, a large sandstone formation will be coming up with the La Sal Mountains in the background. This is Rockland Ranch, aka "The Rock"; a polygamist community started approximately 35 years ago and currently housing 15 families. The photos I have were taken with a telephoto lens as I didn't want to drive up the road and disturb the folks residing there. Hubby and I had heard rumors of a community living out in the middle of nowhere, so were surprised to actually come across it. Following the long, winding, dirt road of CR 131 leaves Rockland Ranch behind you, but another surprise is just around every sandstone hill. stove sits in one of the "homes" with mattresses designating it as the sleeping area; the other holds a couch. Most likely these interiors were first blasted out with dynamite before the walls could be hand carved to smoothness. Open the windows of your vehicle; whether by its movement, or a desert wind, breathe in the soothing and healing scent of the sage. Feel renewed and revitalized as you travel to the final point of your destination...Looking Glass Arch. Enjoy your journey through the middle of the desert.